This cabin is fantastic for large groups! It is a 5 bedroom with 2 baths and will accommodate up to 12 people. Located in the woods, it offers a very unique rustic experience. Privacy, seclusion and the great outdoors, with all the comforts of home including: a large covered porch, bar, a deck, VCR TV for playing DVD's (no reception), fully furnished kitchen, outside charcoal grill, picnic table and fire ring (linens not provided). Abundant firewood is available on the property for foraging, or available for sale at a small cost. No pets are permitted in this cabin. This rental is non-refundable. 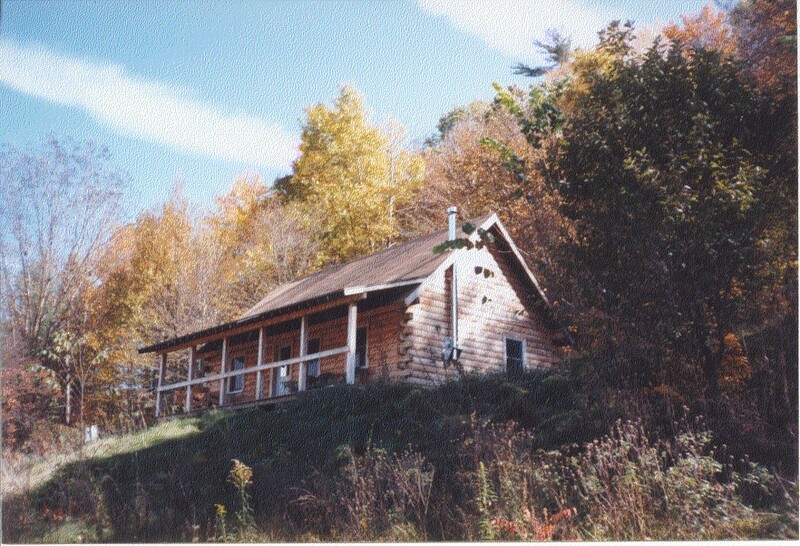 The Deer Meadow Cabin (overlooks a meadow frequented by deer and turkey) has two bedrooms and a loft and can accommodate up to eight people. Each bedroom has a queen size bed and the loft (accessed by stairs) has a queen bed and two twin size beds (linens not provided). There is a spacious bathroom which has a large shower. The great room consists of a living area with a cathedral ceiling and a full-size kitchen with all of the dishes, utensils, and cookware supplied. There is a television for playing video tapes and dvd's (no reception). 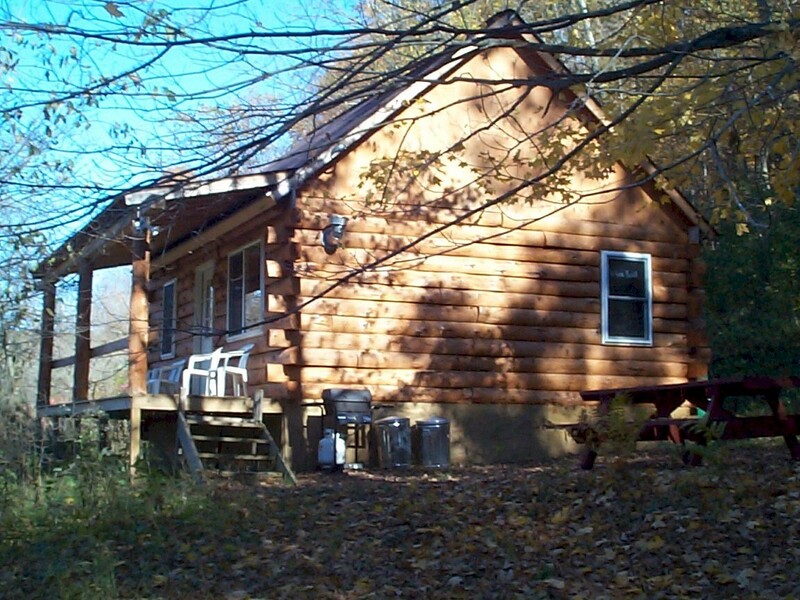 There is a front porch that runs the length of the cabin and overlooks Pleasant Valley. Outside the cabin is a picnic table, charcoal grill and fire ring. There is a playground on the property for the younger ones in your group, and plenty of hiking for the older ones. Guests are welcome to pet and feed any of our farm animals (the horses love apples!). No pets are permitted in this cabin. Log Cabin: "The Bird's Nest" (780 sq. feet) (Click: Photo gallery of "Bird's Nest" ) Built 1999. This is our pet friendly cabin. Hand crafted in 1999, the Bird's Nest (decorated in bird decor with outside feeders for bird lovers) is made from local white pine logs that we hand hewed with a drawknife, giving it a very unique look. This cutely decorated cabin has 1 bedroom (full size bed), plus 2 loft areas accessed by steps (2 twin beds in one loft and a double bed in the other loft). The large bathroom has a shower/tub and toilet, with the bathroom sink located in the hallway for easy access when the bathroom is being used. The living room/great room area has a cathedral ceiling, a fireplace, sofa, and a television for playing DVD's (no reception). There is a kitchen with full size appliances with all of the dishes, utensils and cookware supplied. Outside the cabin is a porch that runs the full length of this 26 x 24 log cabin and a picnic table, charcoal grill and fire ring. This cabin is great for outdoor fires, sitting on the porch and watching the birds, and just downright relaxing! Come and enjoy watching the humming birds and the Red necked Grosbeaks! (We permit pets in this cabin, with prior arrangements). This is an incredible cabin. Our most luxurious, this cabin has a glorious view and a very unique design. There are three levels, with a walkway leading to the bedroom. The beautifully tiled bathroom includes a deep-set bathtub for a relaxing soak. 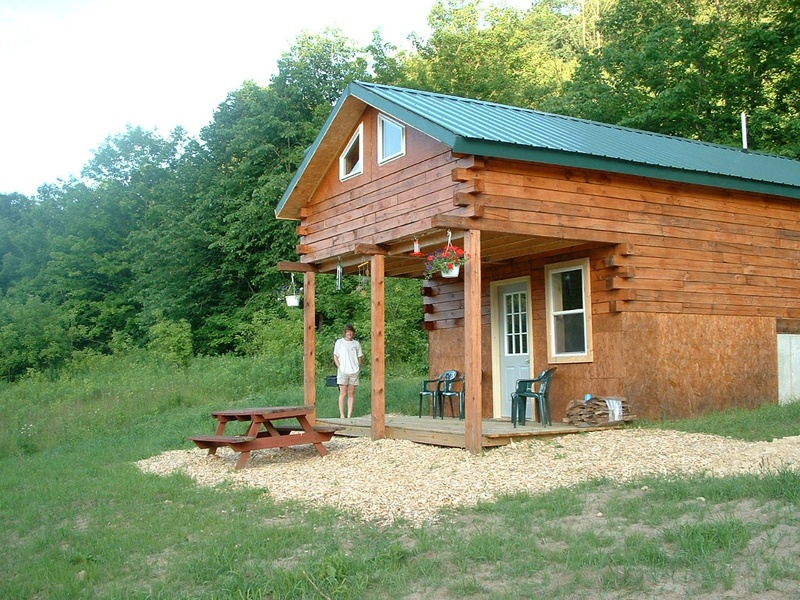 With kitchen, bath, living room and bedroom this cabin provides all the comforts of home. There is a covered porch that provides a view of the valley in a private setting. The bear theme creates a welcoming atmosphere and the perfect "up-north" feel. This cabin is the perfect romantic getaway setting for a weekend, a honeymoon or a week long excursion. Enjoy an outdoor bonfire and an outdoor barbecue on the grill and picnic table provided. On a rainy day, snuggle up to a good book or watch a classic movie on the telly (no reception. dvd's only). Come and relax your cares away. No pets are permitted in this cabin.